DIVERSIFIED agribusiness Ruralco Holdings has delivered a statutory net profit after tax of $16.1 million for the six months ending March 31, a 30 percent increase on the same period last year. The result was driven by postive operating leverage, on-target earnings from acquisitions and further improvement in cost to serve, the company told the ASX in a statement. Revenue was up 7pc to $920m, and underlying pre-tax earnings were up 11pc to $37.1m. For comparison, major rival Elders last week delivered a six-month NPAT for the same period of $41.4m. Its rise was up 8pc year-on-year. Ruralco’s chief executive and managing director, Travis Dillon, said the company’s Future Farming strategy had delivered diversified earnings across our activities and geographies. “We’ve achieved double digit growth by focusing on what we can control and getting the foundation right rather than relying on commodity price movements,” Mr Dillon said. The strong result reflected continued organic growth in Ruralco’s Rural Services division and a larger contribution from Water Services. Group underlying EBITDA of $37.1m included $6.1m of earnings from acquisitions in line with management expectations, and on target to deliver the $13.6m full year accretion announced at last year’s capital raising. The continued growth in the private label product category demonstrated the even greater potential for this strategy, he said. The division delivered a strong half through organic growth in rural supplies and an improved cost to serve, which exceeded the anticipated decline in agency results. Rural supplies growth reflected the positive market conditions in early summer. This led to strong sales in fertiliser (up 11pc); growth in animal health and stock feed sales (up 12pc); and increased fencing sales (up 21pc). A further highlight was 56pc growth in sales of the private label product category, Relyon, which grew as a proportion of total rural supplies sales by 4 percentage points. In its third year of sales, this crop protection category now has 100 product registrations. Buoyant sheep and wool markets and growth in livestock volumes continued to support agency earnings and softened the impact of the average 15pc decline in cattle prices compared to the prior corresponding period. Further action had been undertaken to fill gaps in the rural supplies retail network with the acquisition of a four branch rural supplies business, Southern Ag Solutions, in southern NSW during the half. The increasing geographical diversity of the division’s earnings base has balanced out tougher trading conditions in Western Australia and above average rainfall in Queensland during the peak summer selling period. Water Services’ gross profit increased 29pc driven by strong activity within the expanded network and resurgent operating performance in northern Victoria post its restructuring last year. In the division’s water broking business, dry conditions in the south pushed up temporary water prices and volumes traded with a 53pc increase in the volume of trades through the WaterExchange website. Gross profit from water broking increased 51pc to $1.7m. Further expansion in the network was achieved with two water business acquisitions, Team Irrigation and Hall Irrigation. These add specific expertise for water infrastructure projects in Central NSW and South Australia and broaden the geographic footprint of the water services network. 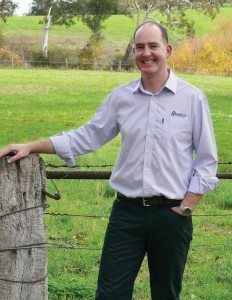 Ruralco is now the largest distributor of Valley and Zimmatic brand irrigation products in Australia. Tough trading conditions in short-haul live cattle export continue the trends observed in the last quarter of last year, with significantly lower consignment trading margins driving an $800,000 loss ($3.5m decrease, half-on-half). The market diversification strategy and the benefit of a strong customer partnership model is delivering increased market share with the business growing cattle volumes exported. The business was well positioned for a recovery in earnings as soon as consignment trading margins improved, Ruralco said. Trade to Vietnam now accounts for 48pc of export volumes and two shipments to China were undertaken in the period. Ruralco’s live export trading business, Frontier, operates under industry and government approved export protocols to safeguard the welfare of cattle. This includes deploying additional stockmen and an independent veterinarian on its shipments. Frontier is also leading an initiative to instigate enhanced independent oversight of live export traceability and compliance and remains focused on the short-haul export of cattle from northern Australia to South East Asia. Ruralco said it continued to target positive operating leverage across the entire business, underpinned by pro-active cost base management, to deliver a declining OPEX/GP% through the cycle. “The delay in the autumn season break is likely to put pressure on crop protection sales and there is potential for seasonal and market volatility in the second half. Despite this, opportunities to deliver against strategy across all areas of the business continue to present themselves,” the company’s statement said. “Our focus remains on business efficiency and expanding our client offer. The diversity of our activities and the geographic mix of operations will continue to mitigate the impact of seasonal volatility,” Mr Dillon said.